Unveiled at Outdoor Retailer last year, the Advanced Elements StraitEdge Angler has finally hit the shelves. 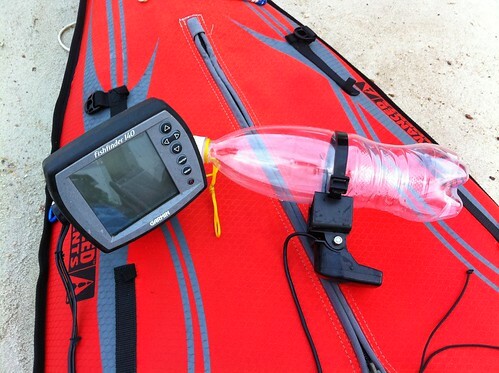 This new inflatable fishing kayak shows that, yes, inflatables should definitely be in consideration when you are shopping for a new fishing kayak. Unlike most other inflatable kayaks, the StraitEdge Angler includes aluminum reinforced bow and stern keel to help maintain a good forward track. This kayak is still an inflatable so even with the added keel, the StaitEdge Angler also handles whitewater better than most SOT kayaks on the market. Advanced Elements added a high-back seat with inflatable lumbar support for long days on the water. The seat also sports a pair of rod-holders. At the front of the kayak is a support bar. The 1" diameter bar will support rail-mount accessories for forward mounted rod-holders and fishfinder. Behind the seat is plenty of room for a crate with all your fishing gear. The StraitEdge Angler measures a nimble 9'8" in length, and a stable 35" wide. It folds up to fit into a duffle bag and weighs in at a mear 41lbs. This kayak is easy to store most anywhere in your home, fits in the trunk, or even straps down easily on a motorcycle. With a pricepoint under $700, its hard not to consider this kayak for anyone serious about kayak fishing. About the Author: Isaac Miller considers himself an "equal opportunity angler" and will fish anything that will take a hook. 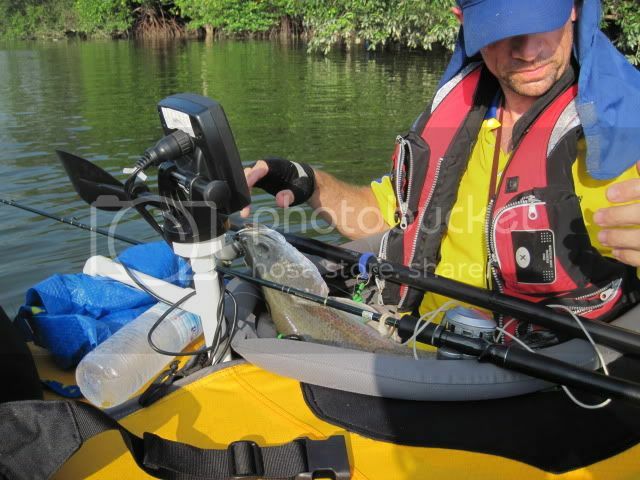 Isaac often makes live internet video broadcasts when fishing from his kayaks, giving up-to-the-second reports on conditions and tackle choices. A YakAngler.com Pro Staffer, Isaac also blogs at www.isaac-online.com and is a host for the www.KayakFishingRadio.com West coast show. So how would the transducer be mounted?